Six rangers from Ruaha National Park were trained on 08 October 2014 and learned to conduct the road surveys for standardized vulture population monitoring. During 9-12 October 2014, four road transects were successfully completed, covering a distance of 347.7 kilometers in Ruaha. Three transects were completed in Katavi National Park between 18-22 October 2014 and covered a distance of 230.4 kilometers. Abundances found in 2014 were comparable to those found in 2013 in Ruaha National Park, while abundances in 2014 were generally less than in 2013 for Katavi National Park. While trends should not be extrapolated from only two years of data, it is useful to note that abundances have not dropped dramatically as would be expected if poisoning rates had increased significantly. 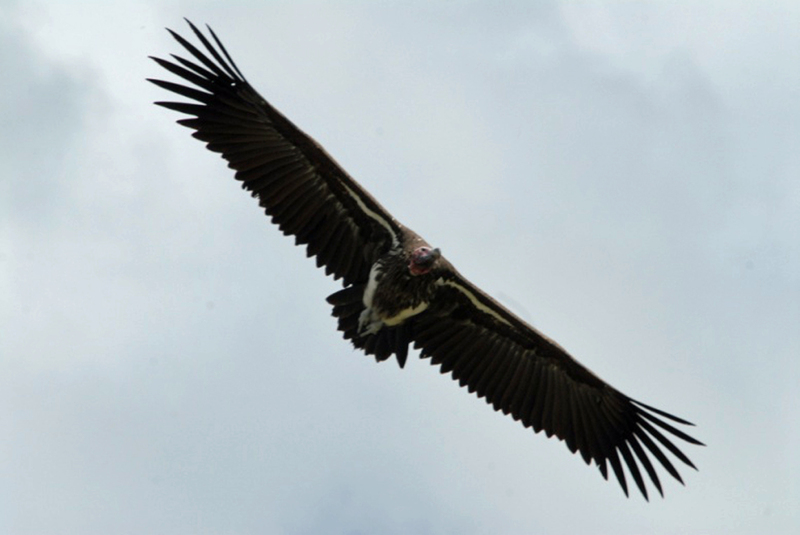 In both 2013 and 2014, White-backed vultures were the most common raptor, followed by Bateleurs. 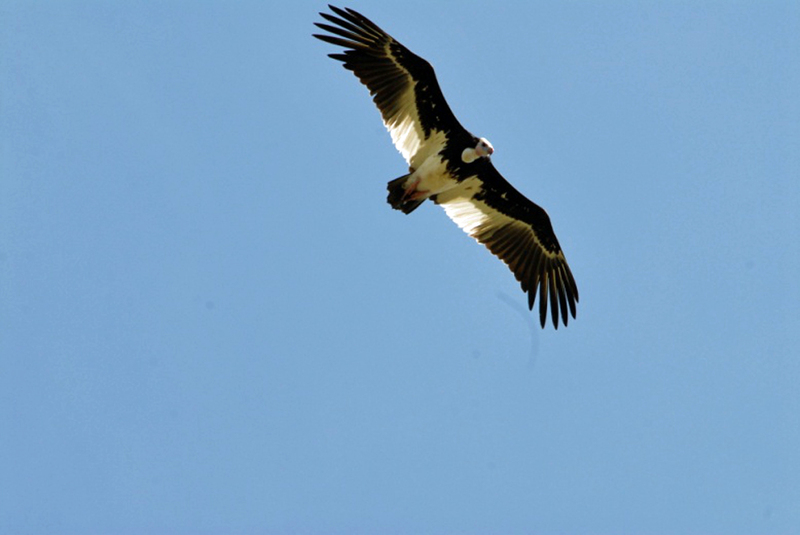 In Ruaha National Park, White-backed vulture and Bateleur abundance was higher in 2014 than 2013, while Tawny eagle, Hooded vulture and White-headed vulture abundance was lower. Lappet-faced vulture abundance continues to be low and was similar in each of the years. One adult Ruppell’s vulture was seen bathing in 2014, though not along a transect. Only one active vulture nest—of a Hooded vulture—was seen in October 2014. 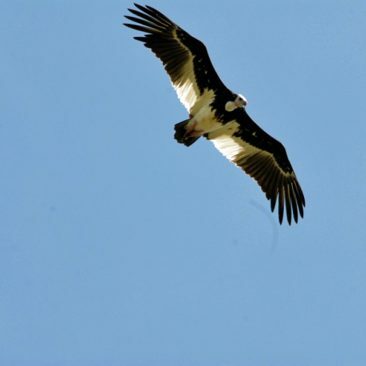 It is likely that White-backed vulture nesting occurs from February to September and thus no active breeding was occurring during the surveys in October 2014. More effort is needed to establish vulture breeding densities in Ruaha National Park. In Katavi National Park, Bateleur, White-backed vulture, and White-headed vulture abundance in 2014 were considerably less than in 2013, but Lappet-faced vulture and Hooded vulture abundance were considerably greater in 2014 than 2013. 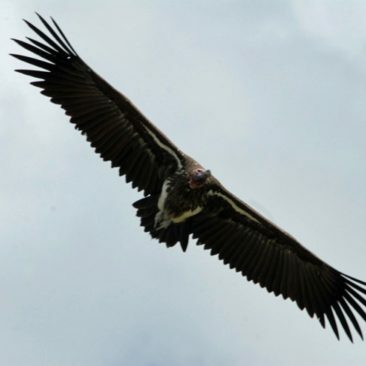 Plans to continue vulture monitoring include repetitions of the road transects established this year, ideally done four times per year (twice in wet season and twice in dry season), although it is likely that only two transects may be completed per year in Katavi. Information on vulture nests and vulture counts at carcasses should now be collected by rangers during patrols and when in the field. Systematic nest searches by car and by aerial surveys should be conducted to further establish abundance data and to monitor population trends. Transects were conducted in Ruaha National Park from 9-12 October 2014 and that data compared to data collected on 22-24 August 2013. 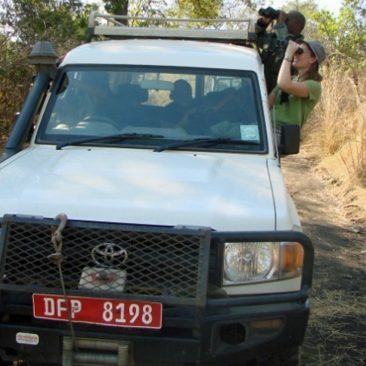 Ten to eleven observers (including two experienced observers and six rangers trained in vulture identification and survey techniques) in two vehicles were present during all transects in 2014. All transects were completed on days of no rain and between 9:00 AM and 5:00 PM, which are the peak activity periods for most scavenging raptors, especially vultures. We conducted four transects totaling 347.7 kilometers in Ruaha National Park. Two of the transects used in 2013 were surveyed again in 2014 with added extensions, and two new transects were added. Transects were conducted in Katavi National Park during 18, 20 and 22 October 2014, and that data compared to data collected on 16-18 August 16 2013. 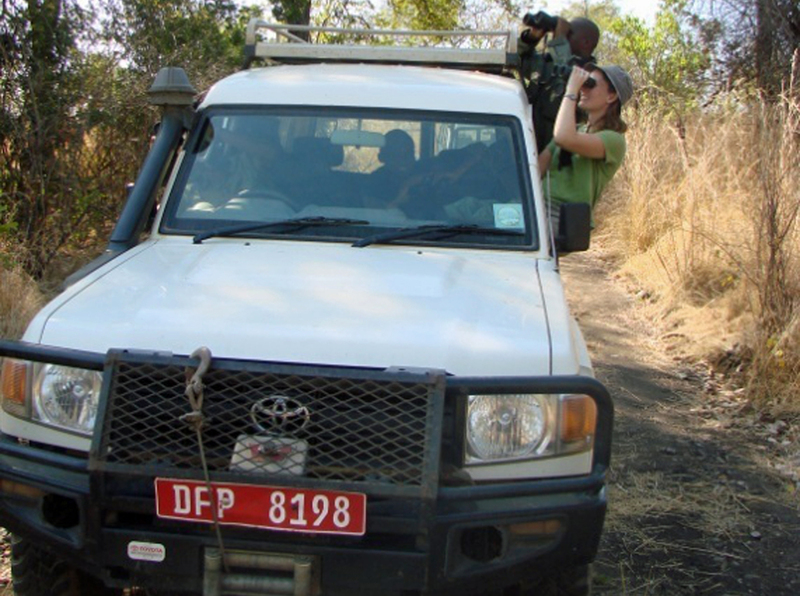 Five observers (including two experienced observers and one park ranger) were present during all transects in 2014. The vulture surveys were expected to start from 9:00 AM to 5:00 PM but, because of rainy and cold weather in the morning, transect start times were delayed (between 9:00 and 11:00 AM). We conducted three transects totaling 230.4 kilometers in 2014. Two of the transects driven in 2013 (Lake Katavi and Paradise Plains) were surveyed again in 2014, and one new transect (Mlele Escarpment) was added to increase the coverage and representation of the park. Abundance of vultures continues to be high in Southern Tanzania and appears to be similar to abundances found in Southern Kenya. Though it is difficult to interpret trends from only two years of data, vulture populations appear to be stable and threats to vultures in the area have likely not increased significantly between 2013 and 2014. Ruaha and Katavi national parks are clearly important ecosystems for vultures, particularly the White-backed and Hooded vultures. Continued monitoring of these populations in the parks is crucial, given vultures susceptibility to rapid decline should poisoning or persecution incidents increase in the area. Satellite telemetry is an important tool for vulture conservation, as it can help establish relevant population ranges or neighborhoods, uncover important breeding sites, and establish principle mortality causes and rates. The use of telemetry to identify the population range of vultures in Ruaha and Katavi national parks will be key for determining the most important sites for future monitoring and conservation. Based on surveys from Kenya and South Africa, it is known that vultures can range over 100,000 square kilometers in a single year, an area much larger than Ruaha National Park and Katavi National Park combined. Because vultures range widely, it is impossible to survey an entire population. However, without knowing where vultures are concentrated at different times of year, findings from surveys can be difficult to interpret. In Kenya, vulture movement studies have helped to inform survey efforts. 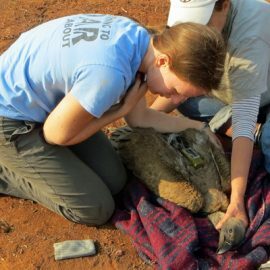 By studying the movement of Lappet-faced, Ruppell’s, and White-backed vultures, Dr. Kendall and her colleagues were able to determine that vulture populations concentrate in Masai Mara National Reserve and northern Serengeti National Park during the dry season. This same population spreads out to a much larger range using much of Kenya, with some birds traveling as far north as Boma-Jongeli in Sudan and Ethiopia and others as far south as Ruaha National Park during other times of the year. As a result of these findings, it has become clear that monitoring of the vulture population can best be done by focusing surveys in Masai Mara National Reserve during the dry season. In particular, changes in abundance seen in this area and during this period are indicative of the conservation status of Kenya’s entire White-backed vulture population. In addition, the findings of vulture movement studies in Kenya were important for establishing the causes and rates of vulture mortality. During a study of vulture movement in 2010, it was possible to establish that poisoning incidents could be causing annual mortality of some vulture species of up to 33%. This understanding of the high rate of mortality being experienced by vultures in Kenya, as well as survey data from across the African continent, led to the eventual up-listing of three vulture species—White-backed vultures, Ruppell’s vultures, and Hooded vultures—from “Least Concern” to “Endangered” on the IUCN Red List. Telemetry studies also allowed for careful pinpointing of where poisoning was occurring, allowing local law enforcement to follow up on poisoning incidents in Kenya and in Serengeti National Park, Tanzania. Studies of vulture movement in Southern Tanzania could also be used to establish threats to vultures across the landscape and to determine mortality rates, an important factor for understanding population demographics. Understanding the population range of vultures in Southern Tanzania will be critical for their conservation in the long term. Based on movement studies conducted on vultures in Kenya and South Africa, it appears that Southern Tanzania is likely to contain a separate population of African White-backed vultures that likely overlaps with Zambia and Mozambique, but may not use Northern Tanzania. Satellite telemetry could be used to inform survey efforts, assess the population range of vultures in Southern Tanzania and provide insights on mortality causes and rates as well as general habitat use patterns. It can also contribute to nest identification and inform us of the breeding status of vultures. 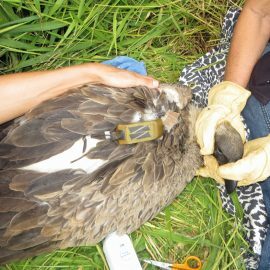 The use of telemetry to study vultures in Ruaha and Katavi National Park is critical for vulture conservation in Tanzania.